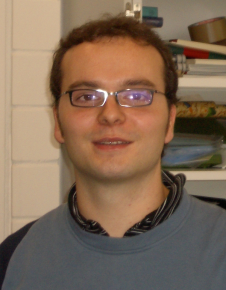 Since April 2007 I am a PhD student in the Theory group of the Max Planck Institute for Polymer Research in Mainz. I am working on coarse graining of conjugated polymers which are used in molecular electronics. Using these coarse grained models, I want to investigate the self assembly of polymers in solution and which role side chains play in this process. I studied physics at the University of Bayreuth and received my diploma in December 2006. In my diploma thesis I investigated pattern formation in motor filament systems using a mean field model.